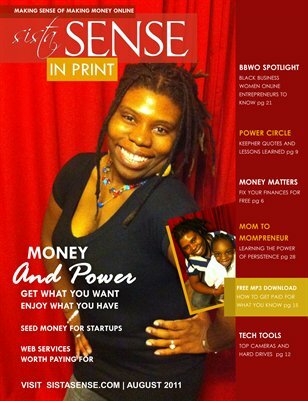 SistaSense In Print Magazine created by web entrepreneur LaShanda Henry. The focus for our 2011 August issue is Money and Power: How to Get What You Want and Enjoy What You Have. Article Highlights include Getting Seed Money for Your Business, Fix Your Finances, SistaSense Power Circle Lessons Learned, Technology Tools: Top Cameras and Portable Hardrives, BBWO Spotlight Members, Video Edting made simple and much more. This issue also includes access to a special mp3 download, "Service Professionals and Entrepreneurs: How to Get Paid for What You Know."